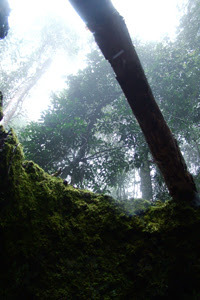 Friday, 22 December 2006 and it must be the only day it has to pour down with rain and the only day i have planned for a bush walk. Bek and I drove to Mt Nebo (North West of Brisbane) where we decided to live on the edge and tramp it for about an hour in monsoon like conditions. Drenched through, we surrendered to the weather and retreated to yum cha at china town in Fortitude Valley. The Carrotbox is an exciting jewellery blog with an archive of information for anyone looking to be inspired. A maker of plastic jewellery herself, there is an online shop and a well researched links page. Merry bag of pressies under the tree! Thankyou to everyone for their support in 2006. I arrived in Brisbane on the 11th December and have hit the floor running. I've been working with the busy little bees at UAP to get the sculpture under way. Below is the most recent render of the sculpture, alongside one of the guys who is putting the sculpture together. I must give Jurko (pronounced yurko) a lot of the credit for his pattern making skills. 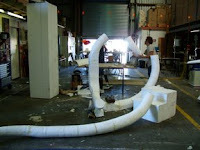 Styrofoam is being used for the form making and then it will be cast in aluminium with an intimately textured surface referencing the moreton bay fig tree trunk textures and leaves. 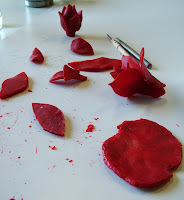 The buds that i have been working on this week (pictured above in wax) will be cast bronze and fibre optics will be travelling through the sculpture to provide the light source to them. 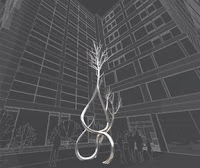 The overall sculpture is going to be measuring approx 8m tall and 2m wide. A scale i have yet to fathom. It is a very exciting process! A beautiful bunch of friends came together for a picnic by the river at Rosevears to wish me a Merry Christmas and safe travels back to Brisbane for the holiday season. 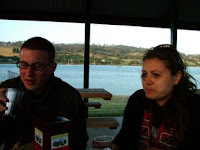 Red wine, whiskey, cheese and crackers were consumed by the tranquil setting of the river. Alas the next night was spent covered in smoke from the East Coast fires. Hopefully they get under control before too much damage is done to homes and the landscape of our beautiful state. Thankyou Annie, Gillian, Helene, Alan, Maree, Renee, Nando, Lucy and Angel for coming along. 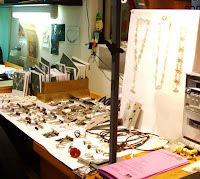 That time of year when the MoB crew pool our resources and jewels to set up for our annual sale and artist swap. Elbows were out and many precious gems were acquired. Thankyou to everyone for their support this year. And to new comers, be sure to join the mailing list and keep up to date with future sales and exhibitions. 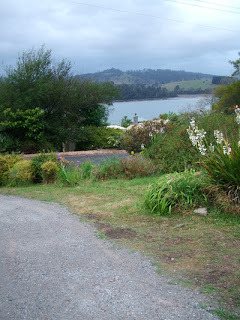 November - December 2006 was spent at Toad Hall in Rosevears, Tasmania. My dear friend Lucy Cameron took me in and gave me my very own room on her property. No electricity reached the small shack that was my room. An outside toilet about 1 km away. A resident possum that only wanted to communicate on my roof at 4:30am every morning. Nightly fires and countless glasses or red wine. The house was an artist's haven. Every corner was inspiration. Here is the view from outside my room. Thankyou Lucy, so very much!